Savage reflectors are essential and inexpensive tools for manipulating light in-studio or on-location. 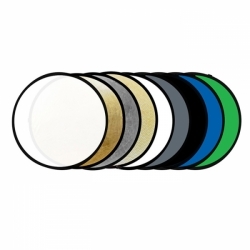 These reflectors provide a wide range of choices to suit virtually every situation. They're a versatile and portable way to create broader, more directional light sources in situations without enough ambient light, for controlling shadows, and increasing illumination to even out contrast and/or skin tones. Savage 9-in-1 Photo Reflectors offers superior control over ambient and studio lighting with 9 versatile surfaces to help achieve any desired look, including: Translucent, Gold, Silver, Daylight, Black, White, Gray, Chroma Green & Blue. 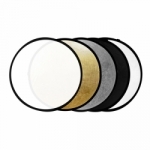 Gray reflector provides 18% gray for accurate light metering. Chroma Green and Chroma Blue can be used as green screen backgrounds for headshots and product photography. Also available in 32 inch, and 43 inch.